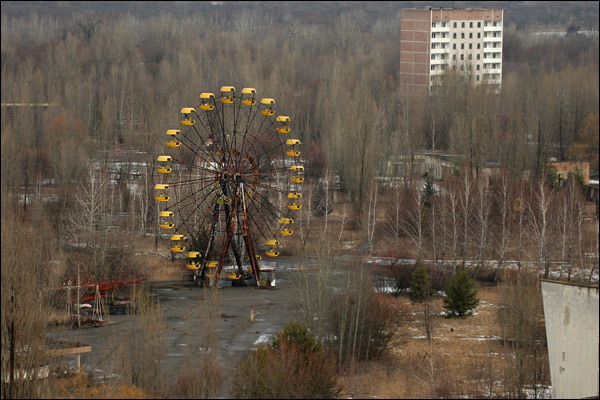 Chris Cope: Happy Chernobyl Day! Today marks 20 years since the Chernobyl disaster. I was 10 years old when this happened. The only thing I remember about it is that I knew it was really far away from Texas. 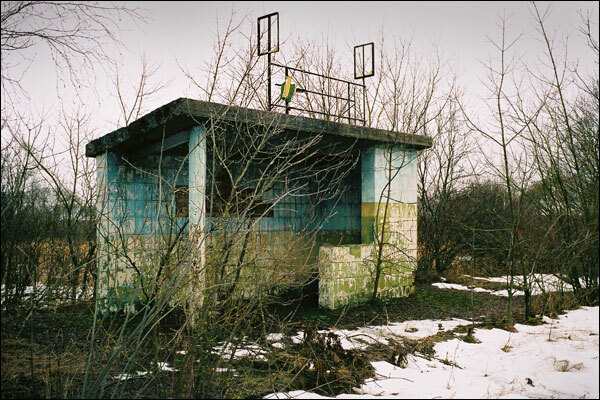 One thing that has always interested me is the fact that it seems to be a requirement that all pictures of Chernobyl must be really bleak and depressing. But there are trees in those pictures; surely the trees must bloom. Surely there must be nice days in Chernobyl -- as nice a day as can be had when everything is lethally radioactive. Random statement from me: "Right now there is an invisible cement truck just above your head. I am keeping it suspended with my mind. If you keep talking to me, I will lose my concentration and you will be crushed to death." This week is National Downshifting Week. To celebrate, I told my supervisor today that I plan to leave almost a month earlier than I had previously announced. The idea of leaving fills me with stupid glee -- I have worked for the benevolent employer for five and a half years. That's a long time to do something you don't really like. I asked a co-worker today whether he was interested in taking my job when I leave, but he expressed doubt about putting up with the monotony: "I might end up drinking too much beer, and writing posts about my mental and physical agony all the time..."
Hopefully that will change in a few weeks. My head is now filled with happy visions of heading downtown and watching World Cup matches at Brit's. On a weekday! Wheee! By the way, I know there are a handful of other folks beholden to the benevolent employer who read this blog. For future reference, when you leave the service of said employer, you will be paid for "up to 40 accrued and unused PTO hours," according to the internal powers that be. This fact answers the question of why I am not leaving sooner -- I need to work until the 9th to be able to burn up holiday pay that would otherwise be lost. This is a picture I found on Flickr today. Its cuteness sort of makes you ill, doesn't it? Add this to my list of exciting places to visit in Europe. Maybe he was trying to kill a panther (step up literary types and show how smart you are by identifying that reference). I think this pic is fated to be "Stolen Picture #8." I don't know the allusion to. Must not be very literary. Reminds me of that country song though. "Bubba shot the jukebox last night..."
If you have a few hours to blow, here's a fun site about motorcycling in Chernobyl. I remember Chernobyl - they really tried to cover up its severity at the time. Imagine if that happened here. Okay, stop imagining - I'd hate to have a cement truck fall on my head. I am sitting here disappointed. Brits!? I work at the Local and our screens are so much better. I am sitting here now expecting you to at least check out our TVs since I read your blog. I was working the games four years ago and getting there at 6 in the morning to set up for the games. You don't even KNOW how happy I am to have it in Germany this year. I fear I'll piddle just a little bit. Hope the games are good wherever you watch them. Go Ireland! - wait... they aren't in it this year. Piddle. Kim, since the food is better at The Local, of course I wanted to go there, but there's nothing on your site about it. I didn't think you were showing the games. Now that I know, I will be at The Local. I h a ve a nice picture of a weird mutated horse at Chernobyl, if you like . It's a bit weird though. I think enough time has passed for a Chernobyl joke. Why can't you wear Russian underwear?